No matter whether this is your first time printing a book or you have done it numerous times before, it is important to read through Same Day Printing’s guide to publishing a book. This will save you time and ensure that everything is done right the first time. We have helped many people print their first book and this manual will answer almost any question under the sun. Make sure you have enough time to read through everything. Get your favorite beverage and sit in a comfortable chair and you will be ready to learn everything you need to know about printing a book with Same Day Printing. It is important to account for bleed. You should allow 3mm for Content.pdf. For Cover.pdf, if you are printing soft cover books, allow 5mm bleed, for hard cover books allow 15mm bleed. Note: Cover artwork for both soft and hard cover books have special setup requirements to allow for the spine etc. Please review cover design requirements – or even easier, have our team set up your cover for you – it can be a bit tricky if you don’t do it everyday. TIP: If you are using InDesign, you can set Bleed under File/Document Setup (you meay need to press the “More Options” button. If you need more specific instructions on setting up bleed you may like to try the InDesignSecrets.com tutorial on Adding Bleeds to a Document. Same Day Printing advises you to use a 12mm margin on the outer edges (bottom, top, and outside edge) of your page. An 18mm margin should be used on the inside/ binding edge of the page. TIP: If you are using InDesign, you can set margins under the Layout/Margins menu. If you don’t know how to set different sized margins, you may want to make every margin 18mm. It is important to note that every book is different, and your needs may vary from these general recommendations. As a rule of thumb if you are not sure, you should print a single book and see how it looks. This gives you an opportunity to get feedback from others. Alternatively, our qualified Creative Team also provide a review service – we can review your artwork and let you know of any core areas of concern with regard to margins, bleeds or other elements you would like some outside advice on – speak with us for a quote. You may think you know how the order of pages works. However this issue has arisen before and we want to be clear about the order of pages when using our book printing services. You will usually supply 2 PDF files for your book printing job. One will be your Cover.pdf and one will be Content.pdf. Page 1 of your Content.pdf will be on the right hand side (otherwise known as the facing page) when you open the book. Just pick up a book at home and check this out to get a better feel for the typical page order that you will find in any novel or textbook. 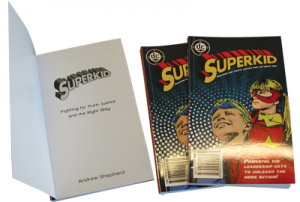 With Same Day Printing you can choose between Hard Cover and Soft Cover perfect bound books. We have included images below to illustrate how this will look on the finished product. Hard Cover perfect bound books are constructed with an “endsheet”. For all hard cover books, when you open the cover there will be a single, blank white sheet, followed by page 1 of Content.pdf. Soft Cover perfect bound books open directly to page 1 of Content.pdf on the facing page. 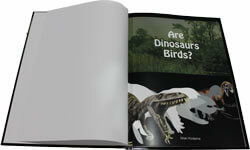 With a soft cover book you can also choose to print on the inside of the cover. 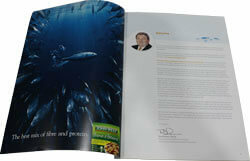 On the sample below, the fish image is printed on the cover, and the text page is page 1 of Content.pdf. TIP: If you want your book content to start on the left hand page, you will need page 1 of Content.pdf to be blank. We highly recommend you number your pages. This can be done in different ways, but always be consistent in placing your numbers. TIP: If placing numbers at the page edge, remember they will need to be on the outer edge, so odd pages (1,3,5) will have numbering on the right, and even pages (2, 4, 6) will have numbering on the left. See this Adobe video on setting up page numbers in InDesign. One of the most important things to be aware of is that if you want blank pages in your document, you must include them in Content.pdf. This is often most important when considering where new chapters will begin. For instance if the last page of Chapter 1 ends on a facing page, and you don’t want chapter 2 to start on the back of the page (left hand side of the spread), you will need to insert a blank page – effectively shifting the first page of Chapter 2 to the next facing page. …And in case you are wondering… yes, blank pages are included in your total page count. Unless otherwise specified, all products are printed with a full colour CMYK process and, as with any full colour work, colour matching is not guaranteed. Please note that, through the full colour print process, print colour may vary from print to print, stock to stock, front to back, and first product of the run to the last product of the run. This is a natural, unavoidable aspect of full colour print. A ‘spread’ refers to viewing the left and right pages connected as one. When designing your perfect bound book, it is likely that you have designed in ‘spread’ mode. Designing this way ensures, amongst other things, that any images that go across both pages are bled properly when your Content.pdf is output – but it is important not to output your Content.pdf as spreads. We require Content.pdf to be a 1-up multi-page PDF. So if you have a 30 page book, Content.pdf will be a 30 page PDF with bleeds and crop marks. Typically we only accept books for printing in PDF files. Make sure to insert blank pages for every blank page. We cannot guess which pages you wish to be blank. The file has been output with crop marks. If we are laying up your cover for you, please supply cover-front.pdf and cover-back.pdf as your page size + 15mm bleed. We will create Cover.pdf from these files. If you are printing a soft cover perfect bound book and would like the inside of the cover printed also, your cover.pdf file will have 2 pages. Page 1 is the outside, and page 2 is the inside. If you don’t have a PDF creator could try downloading one online. There are a range of free and cheap options including CutePDF which is widely recommended for home use. Of course, if you get stuck or would like some professional input into designing your book, our qualified Creative Team are on hand to assist – speak with us for a quote.